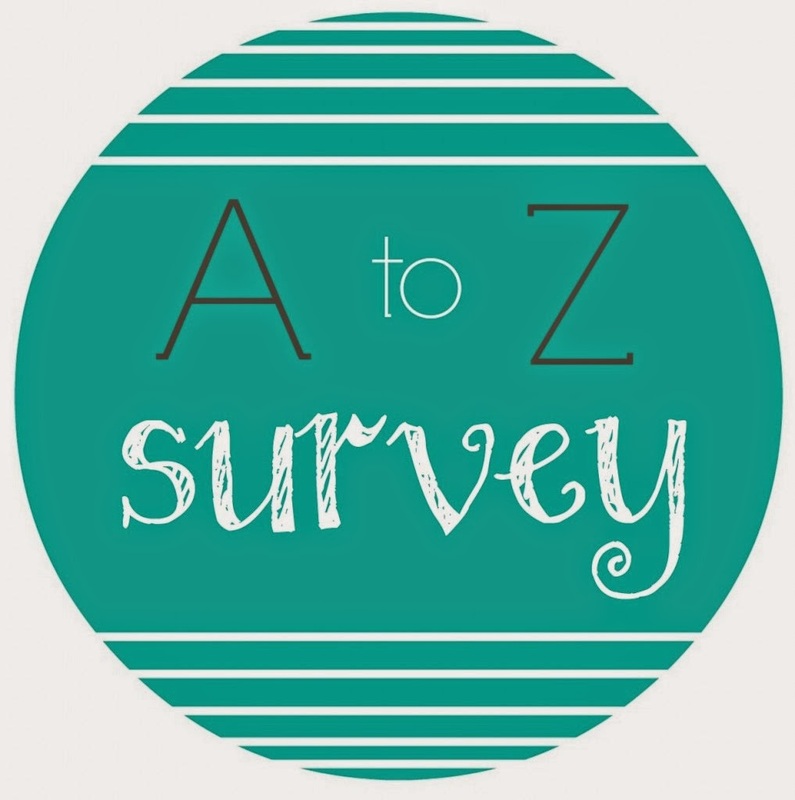 I came across the A to Z Survey over at Roof Beam Reader (though it originated at Perpetual Page Turner.) It's kind of a fun little meme so I thought I'd participate. Probably Stephen King. Even though I've still not read several of his books, he's incredibly prolific and I've been reading him since I was old enough to read entire novels. This is difficult. I may have to go with the best recently read sequel, because otherwise my memory gets a little sketchy. I'd have to say Insurgent (and Allegiant was quite a satisfying conclusion.) That series was consistently very good in a way that most aren't. Depending on the time of day, either coffee or a Manhattan. Maybe Cameron Quick from Sweethearts or Marcus Flutie from Sloppy Firsts. I'm a sucker for the mysterious loner dude. Mostly recently, probably The Woman Upstairs by Claire Messud. I heard mixed things and probably wouldn't have read it if my book group hadn't picked it. In my blog post about it, I predicted that it wouldn't stick with me, but it has. Anything by Sam Savage. I love all of his books and he is not well known, but should be. He's just brilliant. When I went to college and roomed with English majors. They introduced me to all sorts of great books and authors it would have otherwise taken me a long time to discover on my own. The Panopticon by Jenny Fagan, which you should all totally read. I won't complete rule out any genre but am probably least likely to read Christian fiction. I believe that would be Stephen King's The Stand. So far. Three, for two people. It's not enough. The big purple armchair in my living room. Oh, so many quotes, and I don't keep track of them in any organized way. Here's one: "I have unpacked my soul and there is nothing in it." From one of my favorite books, The Cry of the Sloth by Sam Savage. Reading Wolf Hall when what I actually wanted to read was Bring Up the Bodies. I could have skipped the first book, I knew what happened (I've watched The Tudors, after all). But I am allergic to reading the second in a series before reading the first. I know Bring Up the Bodies is supposed to be superior, which is why I wanted to read it, but after putting myself through Wolf Hall I'm unlikely to read anything else by Hilary Mantel ever again. I read The Tea Rose by Jennifer Donnelly and have the other two sitting in a pile, still unread almost a year later. Several people in my family loved the entire series and I don't know why I'm putting off finishing it. Also, Perpetual Page Turner's post reminded me that Sloppy Firsts by Megan McCafferty is the first in a series. I only ever read the first book and I keep wanting to read it again, but I should also read the rest of the series. Little House in the Big Woods by Laura Ingalls Wilder, Firmin by Sam Savage, The Giant's House by Elizabeth McCracken. It's really hard to keep it to just three. Sam Savage, Elizabeth McCracken, Chris Bohjalian, Rainbow Rowell, Justin Cronin....I guess I'm a pretty unapologetic fangirl all around. The new Chris Bohjalian, Close Your Eyes, Hold Hands. His last two were historical novels, and though they were very good, I'm really looking forward to his return to contemporary fiction. I've recently started dog-earing pages, even in library books. I have no idea why this started and I feel both guilty and powerless to stop it. When Nights Were Cold by Susanna Jones. I hardly ever buy books, except as gifts, but last week I inexplicably bought Far From the Tree by Andrew Solomon and Wild by Cheryl Strayed, both of which I've already read. Wool by Hugh Howey. This is the first book I've read in a while that has actually kept me up. It's quite a page-turner. The Perks of Being a Wallflower is my favorite book of all time - I've read it, I don't know, 6 or 7 times? And I have to say, they did a brilliant job with the movie. I almost never like film adaptations, but this one was really wonderful, probably because Stephen Chbosky had his hands in every little detail, from casting to music, from writing the screenplay to picking the set locations. It definitely shows. (And I know what you're saying about Patrick - but Ezra does a great job).